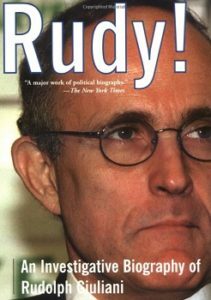 Rudy Guiliani, former NY Mayor and before that a US Attorney, is joining Trump’s legal team in order to bring the Mueller probe to an end. He was credited with making major improvements in the quality of life in New York and bringing down crime during his Mayoral administration in the 1990s; and praised for his prominence in the aftermath of the 9/11 attack. Though questionmarks and scandals have followed him around. His political attempt to run in 2008 election was a flop and he threw his support behind McCain/Palin and was subsequently critical of Obama. His post-NY interests included running a high-worth security consultancy company and joining a law firm with oil, gas, coal and energy clients. As a lawyer he personally defended the makers of the oxycontin drug, being sued for disguising its addictive properties for which they were heavily fined. In the run up to the 2016 election he defended Trump against allegations of racism, sexual assault, and not paying any federal income taxes for as long as two decades. He has suffered from prostate cancer the condition which killed his father when he was 73. Born 28 May 1944 2.30pm New York, he has a maverick Gemini Sun conjunct Uranus and Venus in late Taurus in the legal 9th house trine Neptune on his Ascendant, sextile a ferocious and ruthless Mars Pluto in Leo. He can turn on the charm when it suits him with Moon Jupiter in Leo square Venus but his velvety smile is window dressing for a steely determination. He’s fairly similar to Trump with both having Sun Uranus in Gemini and Mars and Pluto in Leo. 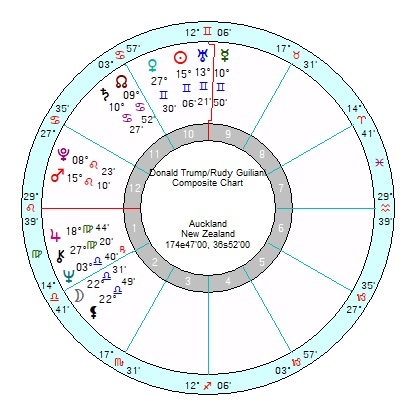 Though Guiliani’s Saturn is conjunct Trump’s Sun, which will put a barrier between them. Their relationship chart has a composite Sun, Uranus, Mercury conjunction square Jupiter – they egg each other on, but they won’t always exist happily in close space together. The composite Mercury is trine Neptune, sextile Pluto (Mars) which is slippery, well-designed for crises situations, but always with the risk of it turning toxic at some point. 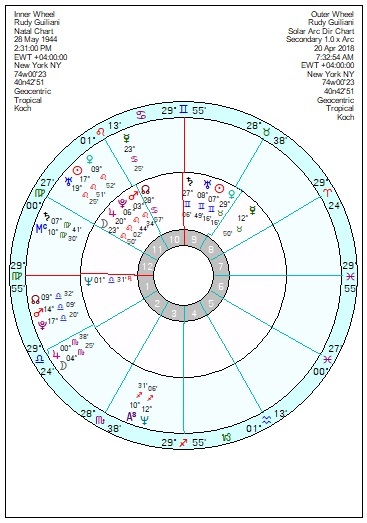 Tr Neptune is undermining the Uranus Sun and Jupiter this year and on till 2020 so the relationship will either face disappointments or turn out to be one. Both like the spotlight so it could turn into a mammoth ego-clash. 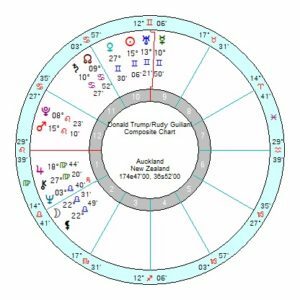 Guiliani’s own chart is a real mixter maxter of influences ahead – a lucky break mid May and another six months hence – both Uranus Jupiters. But June looks upsetting as does mid September to mid October. 2019 is where his real problems blow up as tr Uranus starts to square his Mars, then his Pluto – so a tremendous upheaval with much aggravation. Plus career-losses from tr Pluto square his Jupiter/Saturn midpoint and a panicky, neurotic, undermining tr Neptune square his Sun/Saturn midpoint both of which run into 2020. Though after that he looks back on a high with Solar Arc Sun conjunct his Jupiter. He’s the sort who always lands on his feet no matter how many dips there are on his roller coaster ride through life. I lived in New York during his tenure. Divisive and awful. Crime dropped by as much in dozens of US cities that didn’t have mayors like him. But he used to be moderate on some issues. Now he’s gone around the bend and it’s just pathetic. Like Trump, a pariah in his own city. It’s unlikely Trump will tolerate Guiliani hogging up the oxygen in any room they share. I still can’t believe that Guiliani was the one and only loyal soul who came out and defended Trump after the p-grabbing tape was released, and Trump didn’t reward him with a cushy cabinet position. Guiliani must be a glutton for punishment to go to bat for Trump again. I sincerely hope that Guiliani’s dastardly role in the 911 tragedy somehow gets re-examined as a result of his being back in the spotlight. Are Geminis over represented in politics or what?? (Librans too). Oh geez another Gemini, they travel in packs, I know cause I’m a Gemini & a lot of friends were also born under the Gemini sun, we can discuss 10 subjects in 2 minutes. Giuliani’s the one who hinted at the DNC email leak right before it happened, I can’t believe he’d put himself in the spotlight again. Many, many blessings and thank you for your time. Re Rudy, from this New Yorkers perspective, they don’t come any viler. His third wife, a month or so filed for divorce. And for our safety, I hope Trump and Guiliani partnership don’t end well.